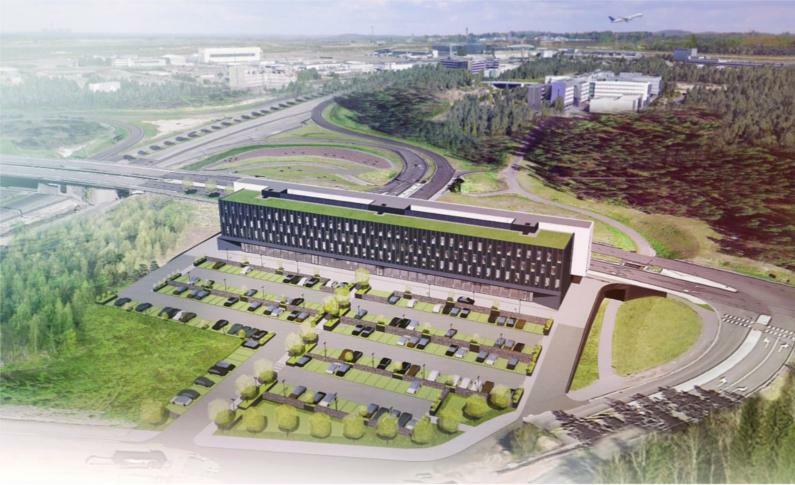 In the year of 2019 the stunning head office level office building is going to be completed, the building is located at Vantaa Aviapolis, upon Tikkurilantie, within easy reach of E18 (Kehä III), close to Helsinki- Vantaa airport, on a spot that will be noticed. Toimistotalo Robert is equivalent to modern-day companies space solutions, the adaptability of offices and modern technology will guarantee your company the best possible work environment. At Robert there will be 10 000 m² office space in total at four different floors. At Robert your company will be seen thanks to the fleeting traffic flow, at the crossrode of Tikkurilantie and Lentokentäntie and because of the immediate vicinity of the airport. Aviapolis is one of the most groving business areas in Helsinki metropolitan area, wich will be groving further the next few years, attracting even more international companies. Call +358 50 415 2127 or send an email to eero.asikainen@premises.fi for more information. Where can you find the best alternatives for your company? When you are looking for premises, you may wonder why there is so little information about properties online when there are so many leasing agents and many of them even offer the same premises. Why is that, who should you call, which party is good and reliable? We are waiting for your call at CRE and we know the answers to your questions. Would you like a free estimate and a professional opinion? Give us a call or send an email and our experts will be in touch. We will survey your property professionally and confidentially. We will present a solution for you that will support the objective you have set while considering your needs and wishes. Whether the property to be sold is a major portfolio or an individual property, we at CRE guarantee that we focus 100% on a successful sale. We can help you as we are familiar with the market! Contact us and we will tell you about the market situation and the kinds of premises available on the market, or premises that are not officially for sale. We will review your investment plan together or your need for premises, if you are looking to buy for your own use. After the assessment, CRE’s experts will provide you with investment properties while carefully considering your objective. It is better to make major long-term financial decisions together, with the help of experts.